The Demag 400-tonne CC 2400-1 ... well established machine. 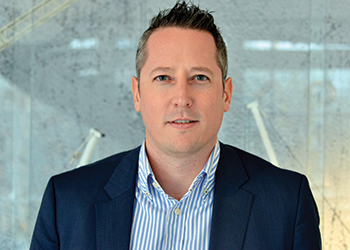 Spearheading this goal is the company’s new senior sales manager Jorg Muller, who outlined to Gulf Construction the initiatives being taken by the leading crane specialist to drive this ambition in the region. “Our goal at Terex Cranes is to become the most responsive company in the industry. This means on the one hand to take advantage of our global organisation, and on the other to be present in the region. In the Middle East, we have expanded our sales team from two to three members in order to extend face-to-face time with our customers. Our focus is to be even closer to customers – from a sales as well as from a service perspective,” he said. Terex Cranes offers two brands: Terex and Demag, which it reintroduced last year. Under the Terex brand, the company offers rough-terrain, tower, HC, BT Pick and Carry, and truck cranes. “The Terex brand stands for steady workhorses that deliver consistent results. They are reliable, tough and efficient machines that deliver day after day,” Muller explained. Muller ...getting closer to the customer. With the Demag crawler cranes, the company is a market leader in the region. The 400-tonne CC 2400-1 and the 600-tonne CC 2800-1 are established machines. The company has recently delivered the first 650-tonne CC 3800-1 in the region to Integrated Logistics in Kuwait, in an order for a total of 31 cranes. 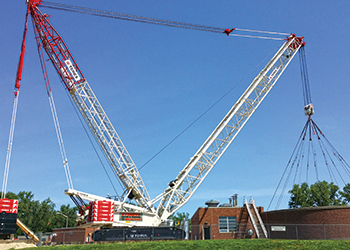 Muller listed safety, versatility and transportability as some of the key advantages of these cranes. Safety, he said, is a top concern especially in the Middle East. Petrochemical jobsites demand amongst the highest safety standards in the world. “Terex Cranes strives to push the barriers higher and develop new and improved safety measures. For example, the crawlers have the ESTA (a prestigious European crane and transport industry event) award-winning fall protection system, railings all around the machine and in components access points, redundant systems, etc,” he pointed out. Demag machines are versatile and have the ability to take on a wide variety of jobs, therefore reducing the need for special or dedicated equipment or attachments. Speaking on their transportability, Muller said designing a crane that can lift hundreds of tonnes is no easy task, but designing a crane that can lift hundreds of tonnes and still be easily transportable is yet another major challenge. 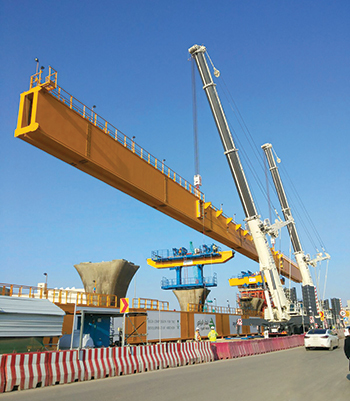 Terex cranes at work on the Riyadh Metro. Under the Demag brand, Terex Cranes is planning several launches in the AC range this year, including the new Demag AC 300-6, a 300-tonne six-axle crane with an 80-m boom. This machine will try to build on the popularity of the current AC 250-6 in the region. Meanwhile, under the Terex brand, the company unveiled the new 90-tonne Terex RT 90 crane at last year’s bauma construction machinery and equipment expo in Germany. “This machine features the IC-1 control system which offers unprecedented capabilities in a rough-terrain crane. It is intuitive, easy to operate and makes troubleshooting simple. The five-section, full-power boom of the crane stretches 47 m for long-reach applications,” Muller remarked. Primary applications are general construction, equipment unloading and placement, steel erection, bridge construction, rental services, drill rig placement and service, and refinery refurbishment and maintenance. Among RT cranes, the Terex Quadstar 1065 (65-tonne capacity) and 1075 (75-tonne capacity) are quite popular in the Middle East. The main advantages of these robust machines are versatility for lifting requirements and site conditions, manoeuvrability, ability to pick and carry, and ease of operation. Among other cranes, Muller said he sees a great potential in the wind power industry (for example, in Saudi Arabia) for the Demag CC 3800-1 crawler crane, which is especially suited for wind turbine erection. “For constructing larger turbines, the CC 3800-1 offers the highest reach and lift capacities in the 650-tonne class, and it can be equipped with special options that boost lifting capacities and boom heights, while reducing rigging time. “When configured with its Superlift mast, long boom and LF fixed jib, a 168-m hook height and 99-tonne lifting capacity are achievable, allowing for installation of wind turbines with up to 165-m hub height,” he added. Terex and Demag cranes are working on all kinds of projects in the region. To name a few, they are heavily involved in the construction of the first nuclear power plant in the UAE; they make special lifts in refineries; are working on infrastructure projects such as the Riyadh Metro and bridges in the region; as well as in airport construction, such as the Midfield Terminal at Abu Dhabi International Airport.